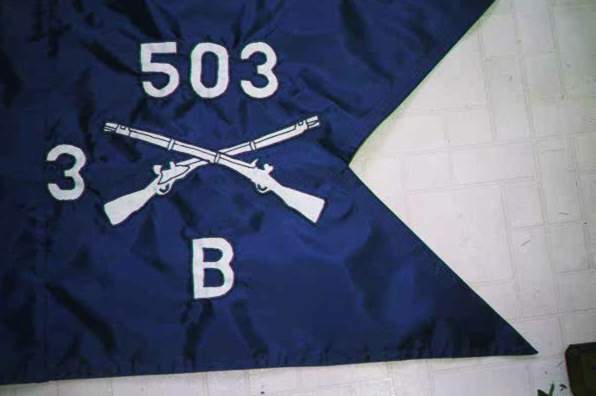 A finished Infantry guidon is displayed here. This is a double sided read correct guidon. The guidon is made to military specifications. After our customer orders a guidion and informs us to what company and other information is to be on the guidon we send them a proof. The proof (click link) FW INFANTRY01 that our customer receives prior to Flag-Works making their Infantry guidon. The proof shows both sides of the guidon, this guarantees that the guidon will look exactly as required which is letters and numbers read correct on both sides and the insignia is single reverse. The size of a guidon is determined by Institute of Heraldry, Departartment of the Army, Base drawing for US Army and US Air force Guidons 5-1-4 Revised 12 November 2002. Description states: A guidon is a swallow-tailed unit marker, 20-inch hoist by a 27 3/4-inch fly, the swallow-tail end forked 10 inches. Fringe is not used on guidons. Following the above guidelines insures that a Flag-Works guidon is made to Military specification and to the customers needs. Please note that the Army regulations 840-10 and wikipedia states a guidon dimension is 20″ x 27″. They are both in error. The above information is straight from the Institute of Heraldry, today. A new revision will be coming out to correct the Army Regs. The schematic drawings that we use to make the guidons were never changed to 27″ and never will be. Be careful you can’t always believe what you read. Ha, now do you believe me? If you would like proof please leave a comment and I will send you a copy of the schematic for the guidons. This entry was posted in Military Guidons, Uncategorized and tagged 20"x 27 3/4", 20"x 27", army guidon, infantry, infantry guidon, Institute of Heraldry, Military Guidon, Military guidons, Military specification on March 11, 2013 by admin. Can you send me a copy of the schematic for the guidons the said it don’t change the size of it.